Thon Hotel Munch is a good option if you want to live in the center of Oslo, but not in the main streets where it can be very noisy. 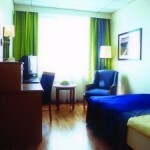 The hotel has more than 180 rooms, it has three stars, and it is very close to for example the National Gallery. Wireless internet is available at additional cost and this is a hotel for those who plan to spend most time somewhere else. I stayed one night in Hotel Munch. The room was okay, not super, but the bed was okay and the bathroom was quite okay as well. A nothing special hotel, but the location was nice and the staff was friendly. They let me check in around 10.00 in the morning as the room was free.